The driver of the Don Mariano Transit bus that plunged from the Skyway died last Monday after being confined to a hospital after the incident. To some, perhaps, the first thing that came to mind was that his passing meant one less reckless driver in our roads. The idea that streets are safer without him and his kind of drivers is not at all new nor is it considered unfair by many who have experienced or victimized by reckless driving by bus, jeepney, UV express, or taxi drivers or have encountered them in traffic. To be fair, included in this list are private car and truck drivers and motorcyclists who seem to think they had the roads to themselves and all other road users must adjust to their driving styles. The thing is, most road crashes are preventable if only people drove more carefully. Discipline on our roads have been the subject of a lot of writings, news reports and documentaries, and nowadays even amateur videos uploaded on the net. The latter videos show how difficult (or terrifying) it is to drive in Philippine roads. In fact, I have a balikbayan friend who’s on vacation from the U.S. who says she screamed every time her father maneuvered their car in traffic as they drove to Makati. She seemed to have gotten used to the more discipline driving in Memphis that she forgot about how to drive in Manila streets. One problem is that many professional drivers, those whose jobs are to drive vehicles like taxis, trucks, buses, jeepneys and UV Express, are not formally trained. I say many because few are certified by the government-run Technical Education and Skills Development Authority (TESDA) or any school offering formal driving courses. Those who get certification are usually people who want to work abroad and need formal certification as a requirement by foreign firms or recruitment agencies. Driving schools are generally for those seeking a non-professional licenses, i.e., those who want to drive their own cars. And from what we see when traveling along our roads, most private car drivers are also guilty of reckless driving. I have seen many who seem to think that they are stunt drivers, weaving in and out of traffic, frequently changing lanes and cutting the path of other motorists (many motorcycle riders are guilty of this, too). This is a systemic failure on the part of the Land Transportation Office (LTO), which is the agency in-charge of licensing drivers. This crash involving a taxi and truck in Katipunan just across from the U.P. Town Center backed up traffic along C-5 as the two vehicles occupied 2 of the 3 southbound lanes of the road. From the looks of it, is seems the truck driver either lost control of his vehicle or made an error as he attempted to switch lanes. Preventable, too, are many causes of traffic congestion such as minor road incidents and vehicle breakdowns. In the latter cases, it is the responsibility of vehicle owners whether they be private individuals or bus companies or logistics firms to properly maintain and operate their vehicles. As such, they are primarily to blame for most breakdowns. I say most, because there are instances when flat tires are caused by objects on the road. In many cases of breakdowns and other incidents, congestion results from these vehicles not being quickly removed from blocking the road. There is also the tendency for other drivers to be inquisitive (usyoso) so much so that they slow down unnecessarily and thereby contribute to the congestion. This truck broke down just after entering the C-5 E. Rodriguez Flyover in Pasig City at around 5:30 AM. There are only 2 lanes on either the northbound or southbound direction so the blockage created a traffic jam early in the morning that stretched all the way to Lanuza at the time I passed by the area. What was expected by many as free flowing traffic that time of the day turned out to be an early traffic jam. I can just imagine the congestion afterwards when peak traffic started around 7:00 AM. 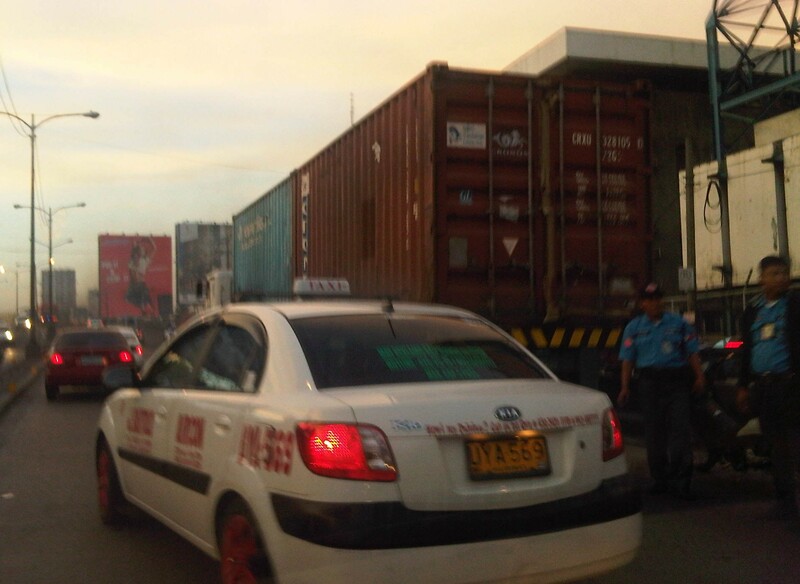 The MMDA enforcers seemed helpless as they watch vehicles passing the truck. In the coming year 2014, we are hopeful that these issues on driving, breakdowns and congestion can be addressed by the responsible authorities. Of course, there will be difficulties, but then as they say “Kung gusto, gagawa ng paraan. Kung ayaw, maraming dahilan.” (If they want it solved, they will find a way. If they don’t, they will make all the excuses.). By d0ctrine in Road Safety on December 28, 2013 .